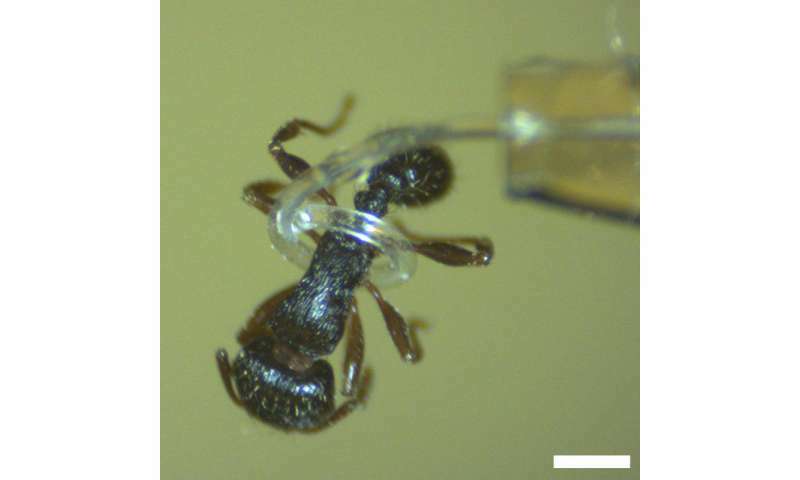 No harm done: a soft robot tentacle can lasso an ant with no killer motives. The tentacle can handle tiny, fragile objects, the result of a soft robot that curls itself into a circle with a radius of just 200 micrometers, said New Scientist. Iowa State University is where the action has been on this feat; Assistant Professor Jaeyoun Kim and team developed the robot. Easily deformable elastomeric microtubes became their platform structure. Their study, "Microrobotic tentacles with spiral bending capability based on shape engineered elastomeric microtubes," by Jungwook Paek, Inho Cho and Kim, in Scientific Reports, reveals what they have actually achieved—taking robot developments a step further. They have handled the problem of microscale soft robots needing efficient actuators. 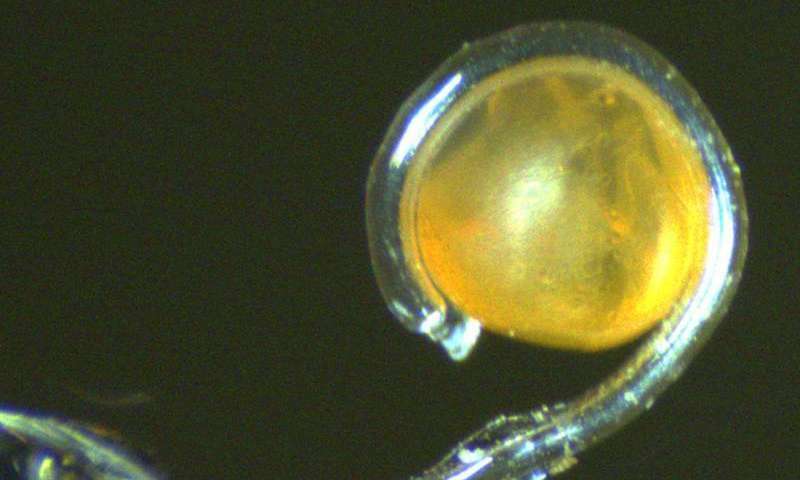 Some shows of the tentacle's abilities: The scientists have optical micrographs showing the micro-tentacle's ability to grab and hold a Mallotus villosus (capelin) egg by winding around it conformally; they also have an optical micrograph of another micro-tentacle grabbing and holding an ant. Soft-robotic efforts have been made to mimic them with pneumatic tube actuators, said the study's authors, "but the life-like, multi-turn spiraling motion has been reproduced only by centimeter-scale tentacles so far. At millimeter- and sub-millimeter scales, they could bend only up to a single-turn." Microscale soft-robots hold great promise as safe handlers of delicate micro-objects but wider adoption would need micro-actuators with greater efficiency and ease-of-fabrication. For applications such as in vivo biomedical manipulation, they wrote, efforts have been under way for microscale miniaturization, but finding those efficient actuators for microscale soft-robots has been difficult. They said that "large-scale pneumatic actuators rely on many sub-elements, such as surface corrugation or valves, that are neither simple nor desirable to replicate exactly at microscale. In all, a successful microscale realization of a pneumatic soft-actuator requires a combination of new designs and fabrication techniques optimized specifically to that length-scale." They applied a direct peeling-based soft-lithographic technique. They also applied "shape-engineering" to the microtube to amplify bending into multi-turn spiraling. "The outcome is a soft-robotic micro-tentacle that can wind around and hold fragile micro-objects with ~200 μm final spiral radius. This spiraling micro-tentacle manipulator, along with the shape-engineering concept and microtube fabrication technique, are all unprecedented," they stated. 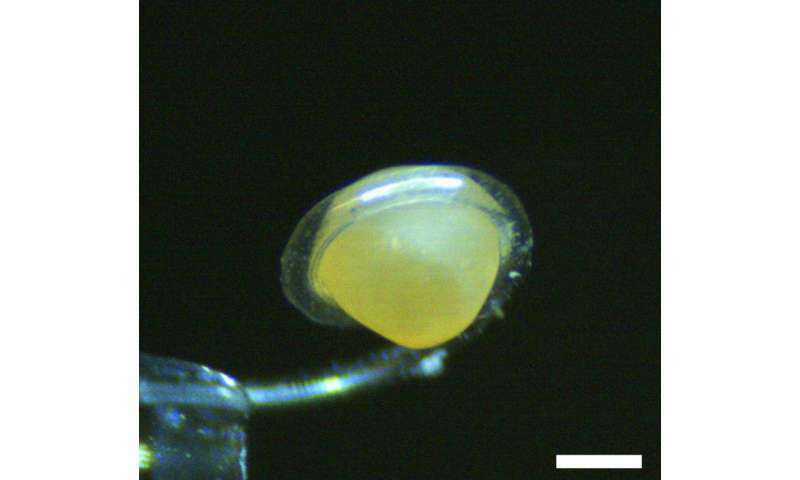 Microscale soft-robots hold great promise as safe handlers of delicate micro-objects but their wider adoption requires micro-actuators with greater efficiency and ease-of-fabrication. Here we present an elastomeric microtube-based pneumatic actuator that can be extended into a microrobotic tentacle. We establish a new, direct peeling-based technique for building long and thin, highly deformable microtubes and a semi-analytical model for their shape-engineering. Using them in combination, we amplify the microtube's pneumatically-driven bending into multi-turn inward spiraling. The resulting micro-tentacle exhibit spiraling with the final radius as small as ~185 μm and grabbing force of ~0.78 mN, rendering itself ideal for non-damaging manipulation of soft, fragile micro-objects. This spiraling tentacle-based grabbing modality, the direct peeling-enabled elastomeric microtube fabrication technique, and the concept of microtube shape-engineering are all unprecedented and will enrich the field of soft-robotics.